In developing countries, the dairy industry has an important role to play in food and nutritional security. To assist Asian countries develop their local milk industries, the Crawford Fund has supported a number of dairy books over the years by Dr John Moran, a retired Australian senior research and advisory scientist from Victoria’s Department of Primary Industries (DPI). for dairy farmers in developing countries and Australia alike. 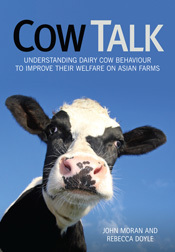 Just published, Cow Talk: Understanding Dairy Cow Behaviour to Improve Their Welfare on Asian Farms, written by John Moran and Rebecca Doyle, is now available to download on-line from CSIRO Publishing. Shows small holder dairy farmers in Asia how to attain optimal growth in young stock. Addresses the entire range of management practices found on tropical small holder dairy farms. Shows smallholder dairy farmers in the humid tropics how to improve feeding of cows cost-effectively. Gives smallholder dairy farmers the business management skills they will need to remain sustainable.